A trip to the beach is a momentous occasion, and when you reserve your stay at Myrtlewood Resort, we hope to satisfy all of your dreams for a memorable and fantastic vacation. Between the resort's fabulous location and exciting on-site amenities, you will feel right at home when you stay at Myrtlewood Villas Myrtle Beach. Each condominium in Myrtlewood Villas features in-house amenities like fully-equipped kitchens, private balconies or patios, and washers & dryers. The addition of these conveniences of home help to make your stay more efficient and relaxing. 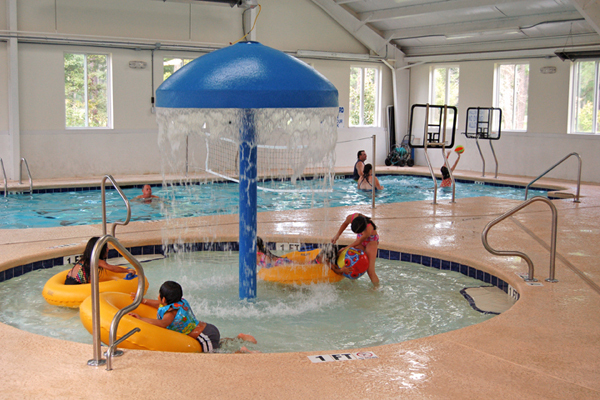 Outside of our vacation homes, visitors can enjoy a wide variety of on-site amenities. When you check in at the Myrtlewood Villas office, be sure to visit our on-site coffee shop, 48th Avenue Coffee, serving up your favorite Starbucks beverages, as well as other drinks and snacks, including chips and ice cream. Visit the coffee shop as you head out for a morning walk on the beach, or grab a snack and take it back to your condo. Before you leave the office, take time to explore our free DVD Now rental program, which allows you to check out movies throughout the duration of your stay. If you're looking to stay active during your beach escape, spend some time at the Myrtlewood Villas Fitness Center, which is open to all guests between the hours of 7am and 11pm. If swimming and water activities are more your speed, visit the indoor facilities, which are open all year and include sparkling pool, lazy river and Jacuzzi, and Kiddie Splash Umbrella. During the warmer months, take advantage of the outdoor pool found in your Myrtlewood HOA community, all of which are open seasonally to all guests. Interested in hosting a get-together or cook-out during your stay? Take advantage of the resort's Group Pavilion area, where you can utilize charcoal grills and picnic tables for family reunions, birthday parties, and more. These areas are reserved based on availability and at no cost. For those looking for a little friendly competition, spend some time playing on the volleyball or shuffleboard courts, or try your hand at the horse shoe pit. Other fun activities include corn hole boards and full-sized checkers. The golfer in your group will love staying at Myrtlewood Villas. Visit the on-site clubhouse for all of your golfing needs, and set up tee-times easily with our knowledgable golf director. With dozens of courses throughout the surrounding area, your beach vacation offers up timeless excursions on the links! No matter what your style or preference, there are plenty of great amenities to keep you occupied and entertained during your beach getaway at Myrtlewood Villas. From exercising to swimming to playing golf, this resort provides the greatest in on-site amenities and experiences.